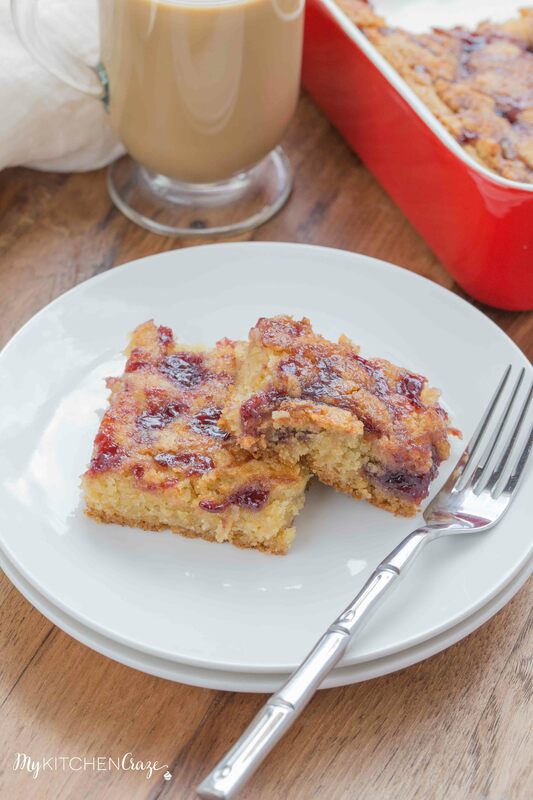 Raspberry Blondies are a delicious bar recipe that’s easy to whip up and tastes delicious! Simple and tasty is the way to go! Father’s Day is fast approaching. Can you believe it? 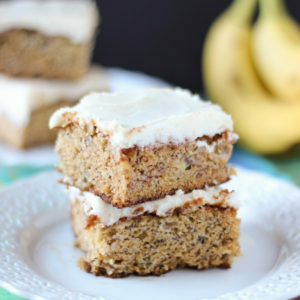 I wanted to share one of my favorite desserts with you all, so you can make it for your special dad. 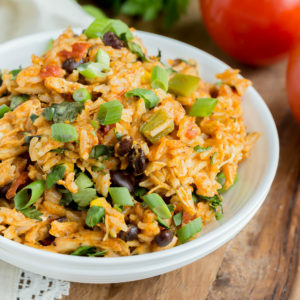 I know my dad loves this recipe, so yours has to too! 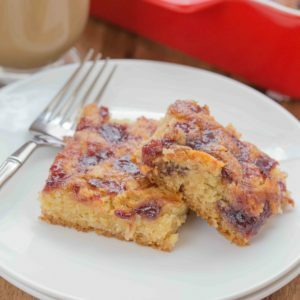 When ever I make these blondies I always think of my dad. My dad’s the type of person that’ll eat almost anything. He isn’t really picky about sweets. I have noticed over the years he’ll eat pretty much any type of dessert but he’s more of a brownie/bars/blondie kinda of guy. 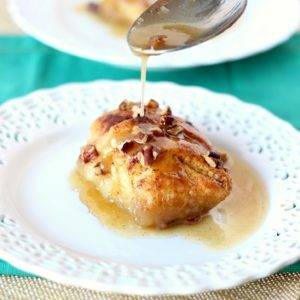 When I made this recipe years ago, I’d never made a bar recipe. I was sure missing out. But I jumped on that bar bandwagon and haven’t left since. Over the years I’ve made these, these and these. So many bars. Yum! 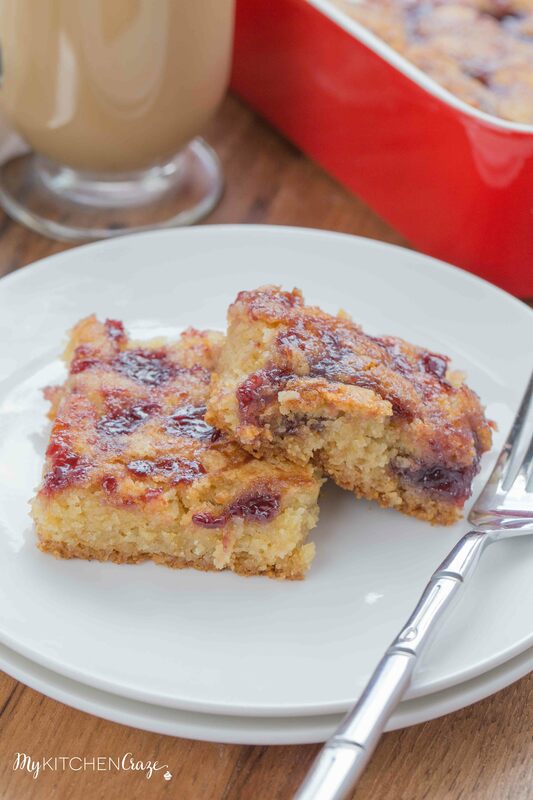 If you’re short on time then you need to make these Raspberry Blondies. They literally take no time at all to throw together and in my opinion are fool proof. Give them a try and I promise you will not be disappointed. 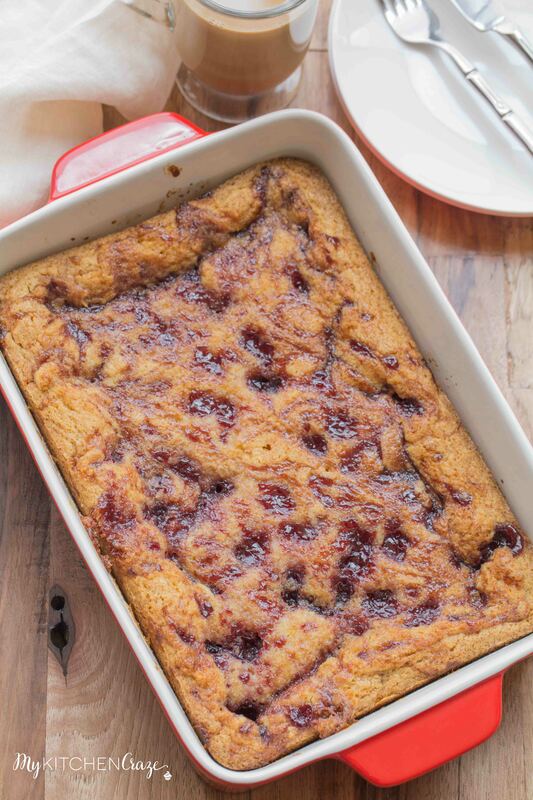 Oh another great thing about these blondies that I almost forgot to tell you (my bad, sorry), is that you can change them up when ever you want. 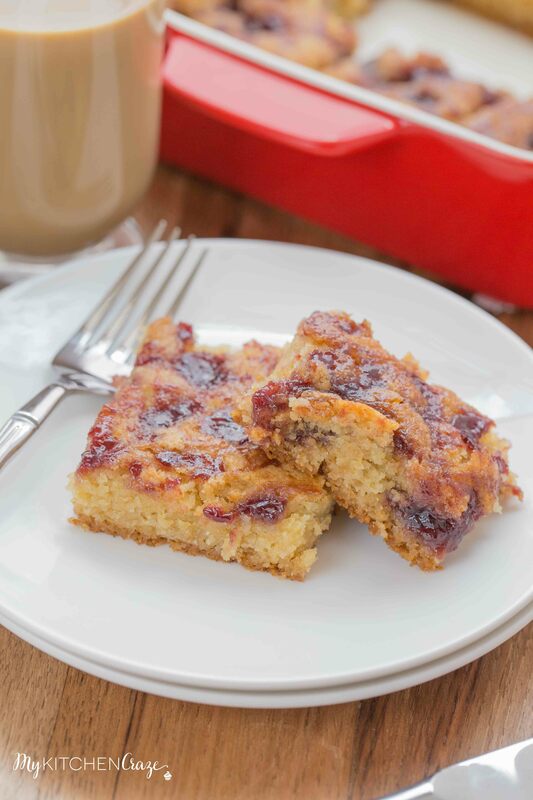 Raspberry Blondies are a delicious bar recipe that's easy to whip up and tastes delicious! Simple and tasty is the way to go! Preheat oven to 350 degrees F. Grease an 9x13 baking pan with cooking spray. Add sugar and melted butter to a medium bowl. Stir until butter is dissolved. Spread the batter mixture into the prepared pan. 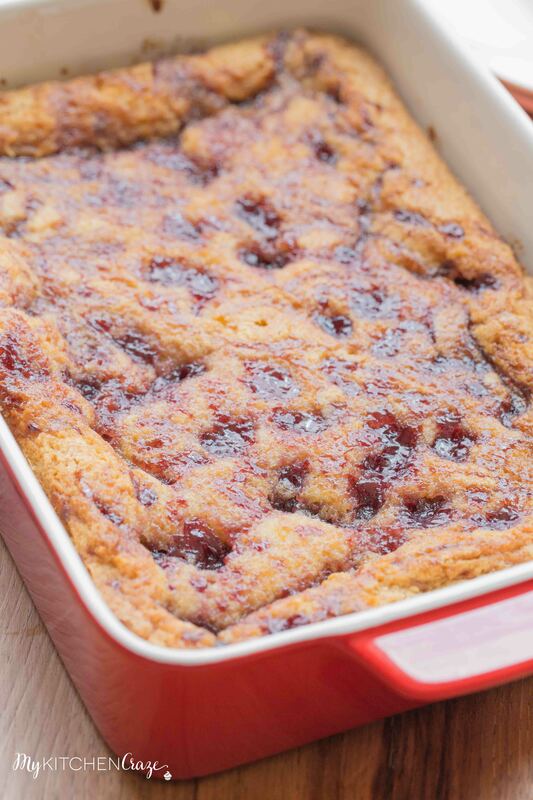 Place raspberry jam over batter mixture. 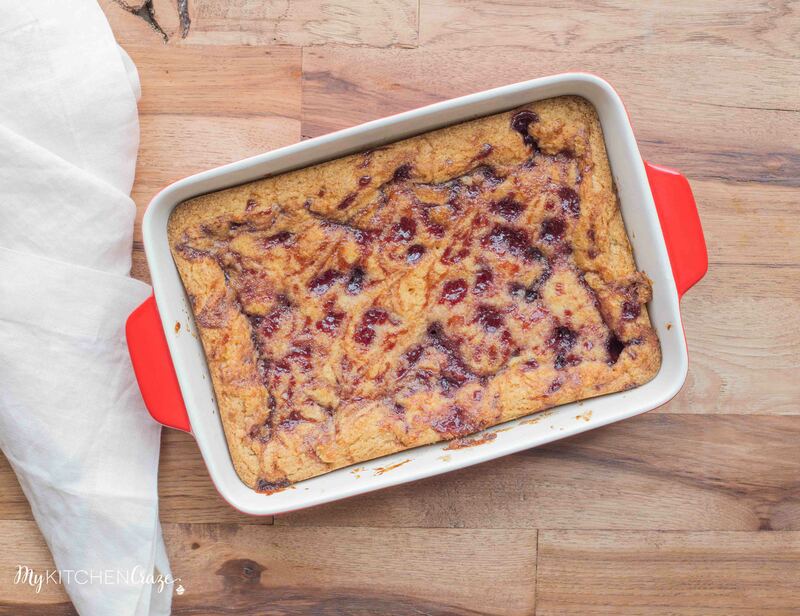 Swirl the jam through the batter with a knife or spoon to create a marbled effect. Bake for 25-35 minutes or until toothpick inserted in center comes out clean. Let cool for 10-20 minutes then cut into small squares. I can’t believe it’s almost Father’s Day, either! And the fact that we’re already halfway through June. Time is sure flying! 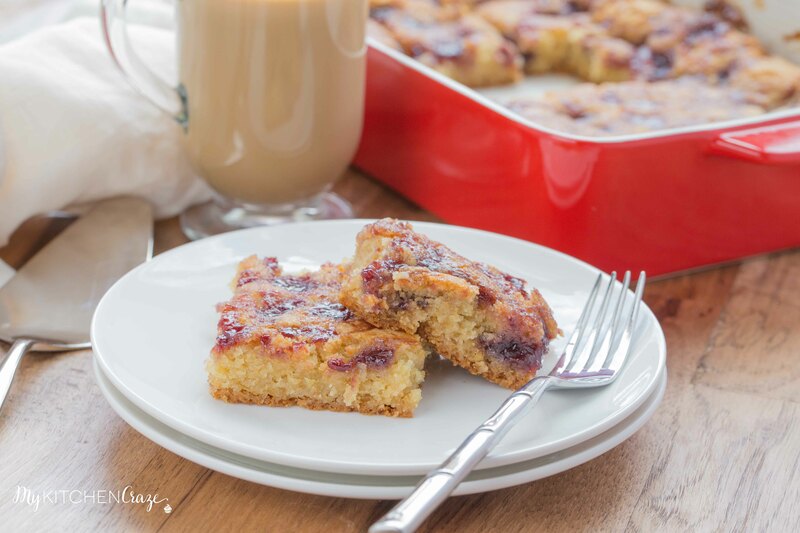 These raspberry blondies look SO good, Cyndi! I could just dive right into that pan for breakfast. I love how moist and flavorful these are. And I’m sure your father would love them, too! Hi Reema! I totally think you could add in some fresh raspberries. 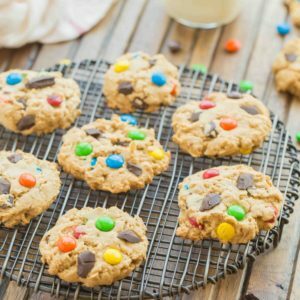 I would just chopped them in half and ad about 1/4 cup at first and go from there. 🙂 Hope you enjoy these.